Congratulations to Emily Walker on five years’ service here at Four Oaks Financial Services. Emily’s career as a valued member of our team is a terrific success story. She started on an Apprenticeship in Administration, which not only gave her work experience but she was also able to study for qualifications in communications and general administration. When her Apprenticeship ended, we welcomed Emily into our Client Support team as a full-time member of staff. As her skills and knowledge developed Emily was promoted to Senior Administrator and a few months later took on the role of Head Of Administration when the manager was on maternity leave. Having done a fantastic job leading the department, Emily took the opportunity to become part of our in-house training academy. She is working towards being qualified to the same level as a Financial Adviser. 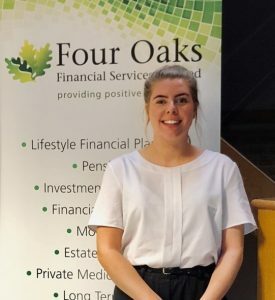 She has passed two exams already and is well on her journey to achieve the Level 4 Diploma in Financial Advice and from there will see where her career opportunities take her. Emily’s current role is working alongside our most senior Financial Adviser who provides financial advice local to Lichfield and the wider Midlands area. Congratulations Emily from all your colleagues and we hope you enjoy your gift from the company. We’ve moved into an additional 186 sq ft of office space as we continue to grow. 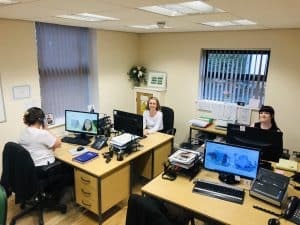 When we had the opportunity to take on more space we decided to have a bit of a move around and created more work space for our team of Financial Advisers who provide local financial advice in Sutton Coldfield and surrounding area. This meant moving our Client Support Department into the new office. It involved re-decorating and moving all the furniture, telephony and IT. 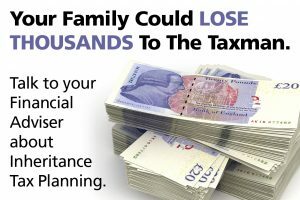 Everything has gone very smoothly and both our Advisers and Client Support staff are pleased to have a lot more room in which to work. It’s Off To A&E For Nurse Alice! We are sad to be losing Alice Heath from our Client Support team but wish her lots of success as she begins her new career as an A&E nurse. Alice has worked for Four Oaks Financial Services for over three years. She began working with us after she completed her A Levels in order to get some experience of working under her belt, before she went to University. Alice has been a valued member of our Client Support team assisting our Financial Advisers who provide expert financial advice local to Sutton Coldfield. She has worked on a part-time and temporary basis being dependable during very busy times, covering holidays and maternity leave; all whilst studying to be a nurse. Alice is always happy to help and adapt to whatever is required of her which will put her in good stead in her new role. Alice studied at Birmingham City University and during her nursing course she had a total of six placements, all at Good Hope Hospital, and it is in Good Hope’s A&E department that she has chosen to begin her nursing career. Alice, we are very proud of you. We are sure you will be a terrific nurse and help lots of people, but hopefully none of us will need your professional assistance! 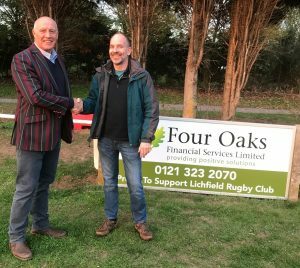 As a firm of financial advisers providing financial advice local to Lichfield we understand how important institutions like Lichfield Rugby Club are to the town. Therefore, when we had the opportunity to sponsor the club we jumped at the chance. 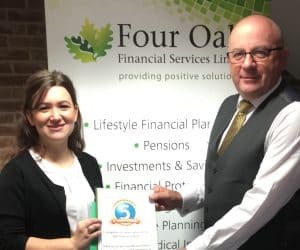 Not only did we see this association as a commercial opportunity to generate awareness of Four Oaks Financial Services, we also thought going to the matches would be a great way to bring our staff together outside work; and of course, help the club through sponsorship and advertising. We’ve already held a family day for our team and suppliers. We’ve been to the opening home games and attended the bonfire night celebrations.